Reports: Insider Satya Nadella Likely To Be Microsoft's CEO : The Two-Way CEO Steve Ballmer announced last summer that he would be retiring. The search for a successor may be coming to an end. News outlets report that one of Microsoft's executive vice presidents is in line to take over. There's also word that co-founder Bill Gates may be replaced as chairman of the company's board. The nearly six-month-long search for Microsoft's next CEO is nearing an end, and news reports indicate it's likely the technology giant will turn to Satya Nadella, executive vice president of its Cloud and Enterprise group, to lead the company. 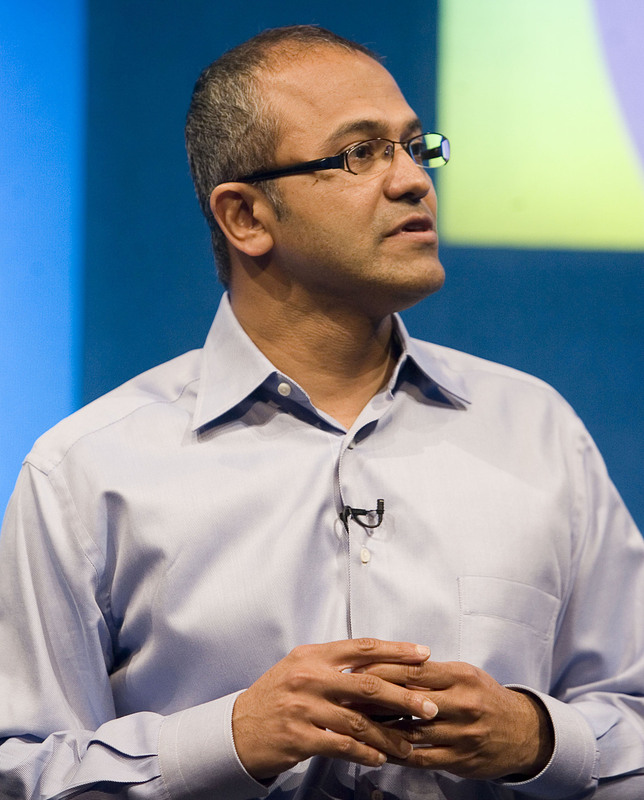 Satya Nadella, who's reportedly in line to be Microsoft's next CEO. Widely followed tech writer Kara Swisher posted on the Re/code news site Thursday that Nadella is "the likeliest internal candidate" to be named to succeed CEO Steve Ballmer, who announced last summer that he would be retiring. On Friday, Bloomberg News followed with word that Microsoft's board is preparing to make Nadella the CEO "and is discussing replacing Bill Gates as chairman, according to people with knowledge of the process." An announcement could come within the next week. Bloomberg adds that "in turning to Nadella, the company would get an enterprise-technology veteran who joined Microsoft in 1992 and has had leadership roles in cloud services, server software, Internet search and business applications." Also, Bloomberg says that if he is named CEO, the 46-year-old Nadella will "need to win over skeptics concerned that an insider can't move fast enough to make Microsoft a contender again in markets led by Apple Inc., Google Inc. and others, said Daniel Ives, an analyst at FBR Capital Markets & Co."
Microsoft has had no official comment on the reports. According to CNET, Ballmer also might end up having his ties to the company severed because "insiders ... say a new CEO might be uncomfortable taking steps that reversed decisions carried out under the Gates-Ballmer regime if the duo still sat on the board." Bloomberg says, however, that "even if Gates steps down as chairman, he may be more involved in the company, said two people familiar with the matter, particularly in areas like product development." The Microsoft board "is in contract negotiations" with Nadella, says The Wall Street Journal, which cites "a person familiar with the matter" as its source. The Journal adds that the source says Nadella has asked for Gates' help — specifically, that the company co-founder "spend more time on technology and strategy" and be a close adviser.